Watch lessons on mobile devices and tablets – Ironclad Money Back Guarantee! 5 Stars! by Jeremy P., 11 days ago· Just what I was looking for. “There is so many self defense systems available today. Most are either to complicated to be used under severe stress or just complete nonsense. I’ve been involved in martial arts for 30 years and been studying reality based self defense for 6 years. “Very easy to learn. I am confident that I could defend myself or my family and it only took a couple of hours to learn” Cindy A. “David thank goodness I found you for your B.E.T. System. This is the best self defense I have ever seen…” Michael M.
“The information in this system is going to blow you away. You will never look at self defense the same way ever again!” Liz W.
Hi, my name is Coach David Alexander and I would like to introduce you to my 38 Lesson Self Defense Made “REAL” Easy—online training course, the only self defense course you will ever have to take. In this course you’re going to learn my B.E.T. “Target Based” Self Defense System which is the fastest to learn and most effective self defense system in the world and has been taught to over 60,000 people in 60 countries and counting. You do not have to be in great shape or some strong super stud to be able to use my system. My system is designed to help the unfit or weaker person to survive a violent attack. If you are in great shape, then you will become a human weapon after learning my system. Every once in a great while, there is a leap forward in thinking…a paradigm shift…this is my self defense system. With this system, you will not need years of study and training to learn to defend yourself or your family from violence…I am going to teach you in just this one course. One of my students said that my system is a “short cut” to a lifetime of self defense instruction. -Intro to B.E.T. a “Target Based” System. You must agree to never use what you are about to learn unless you are 100% in a life or death worst case scenario. I am going to take you step by step through the learning process of this course. By the end of this course, you will know more about protecting and defending yourself and your family from a violent attack than most 30-year martial arts black belts. And it can all be done in just a couple of hours. You will never look at self defense the same way ever again. This course is going to blow your mind. This course consists of a series of lessons and clips demonstrating the system, philosophies, how to practice and how to survive. Lesson 8: Single Punch: or are you learning a martial art that teaches you how to fight? Are you going to be the one defending your girlfriend’s honor and end up in prison because “you didn’t mean to kill him”? People ask me what I would do if someone called my wife a nasty name, would I defend her honor? The answer is no, I would grab my wife and we would leave wherever we are. Now, if my wife and I get pursued by this person and I feel that my life and my wife’s life is in immediate peril, then that is a different story. Module 3 Intro: In this module you are going to be a fly on the wall watching a private lesson. I have added tons of real world examples and lots of extra video clips. Module 3 also covers multiple attackers, added philosophy and also fills in any knowledge gaps that you may have after watching modules 1 and 2. Module 3 is a must watch. Go check it out right now! Lesson 23: Multiple Attackers and a Knife. Even though I am giving you a better chance to survive a violent attack, no one, not even me, is guaranteed to come out of it alive. But you will have a better chance if you take to heart what I am trying to show you. I will also bust several martial arts myths and expose some Hollywood self defense B.S. By the way, I use adult language and situations, and graphic video clips throughout the course to make sure you understand the severity of dealing with REAL violence. Most people don’t have 20 years to learn a martial art in order to defend themselves and their families, I can teach you in just this one course. You’re going to be blown away by what you learn. “I was blown away by what I learned…I could not believe that self defense could be so easy. I learned how to protect myself and family in just a couple hours instead of taking years of typical martial arts classes….not to mention how much money I saved in the process. Thanks Coach!” Mark D.
I can pretty much guarantee that you have never seen a self defense system like mine. There are only a few people in the world that know and can teach this type of self defense and their programs are very, very expensive because you only have to learn it once. My system is for the busy executive, retiree, parent or young adult that wants to learn how to defend themselves and their families from violence right away and would like to be able to learn it and apply it the same day if necessary. My system is NOT a martial art. There aren’t any colored belts, uniforms or rituals in this system. There aren’t any tournaments or trophies to win. This is just REAL self defense for the REAL world, which is why I named this course Self Defense Made “REAL” Easy. It doesn’t matter if you’re young, old or out of shape. My system can help you defend your life or the lives of your family from a violent attack and it can all be learned in just this one course…no other training is necessary. You will not be disappointed. My system does not teach you hard to remember techniques, blocks, kicks or punches, it just teaches you simple gross motor movements, anyone can learn and master in a very short period of time, combined with specific targets that will cause your attacker to react in a certain and predictable way. This is so simple even a child could use it, even though this is definitely not for children to watch. The overwhelming amount of positive reviews I have received from students just like you is a great feeling. When you start this course, I will now consider you one of my students, I love my students and will do anything in my power to prepare you and your family to survive a violent attack. I am so proud of you for taking charge of your life and purchasing this course. I cannot wait to hear what you think. 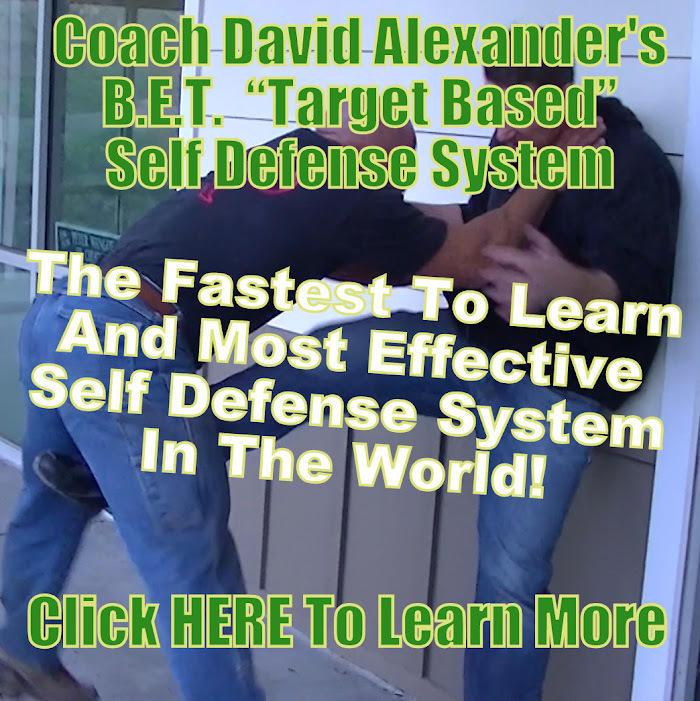 This is Coach David Alexander your online self defense coach. LIFETIME ACCESS! Limited time offer. Am desperately in dare need of learning palm chops of various applications. Am aged 55 and full of life. I shall be very grateful to receive practice videos that will make me a consummate palm chop expert.